•	I believe in the innate value of every person and that we live as servants to our fellow citizens. •	Students are the reason that schools exist; students remain at the centre of decisions, actions and processes within the school. •	Everyone in a school community should learn everyday. •	I am reflective; I am not afraid to question why we are doing things and if they are having the intended impact. •	I am also a person of integrity striving to do the right thing at the right time. I am first a learner. As a learner, I am a curious self-directed seeker for whom simple answers have never satisfied. As a teacher, I am a learner, I strive for a safe and caring classroom learning environment and I my focus is on learners to motivate and empower them to grow their learning capacity. As a principal, I am a learner, a teacher, and I motivate, empower and serve staff in their pursuit to support learners as well as manage the learning environment of the school. In each role, the students and I are learners. I believe all members of our community are learners. My role as a leader is to positively influence the life chances of every member of our community through the lens of learning. Our primary focus is to maximize student’s ability to learn and maximizing their learning. Before Learning can be maximized, learners’ needs must be addressed. We need to stretch to meet the physical, emotional and intellectual needs of our community. When our members needs are met, learning to learn begins. By equipping students to learn, we provide students tools; Tools such as literacy, in its various forms, are required to be successful contributing members of our community and citizens of our global society. With the expected changes in society, students need to become self-directed learners. Once students are literate self-directed learners, we can shift from learning to learn, to facilitating students practicing learning with the required content. Administrators need to demonstration their instructional leadership regularly and support other staff in collaboration, development and exercising school wide instructional leadership. Concrete talk and professional action that is directly related to the technology of teaching is a priority; Professional development directly related to the science and art of teaching is school-based and centered around closing the gap while raising the bar for meeting student learning needs. 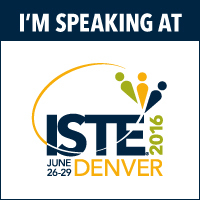 I believe in being data informed and drawing on the resources of the school for making decisions and implementing. I am a man of action; I reflect, consider and then act. A good solution is better than a perfect solution that has been delayed too long. In a mode of continuous learning, solutions can be developed as we move down the path. While decisions are carefully considered, if the action causes problems, I follow up. Leaders need to choose the right role for the right time and be clear about why they are acting that way. Leadership includes doing the right thing even if it doesn’t seem popular. I am confident that I can move between the role of manager and leader being very clear of the expectations while I am in that role. The leaders of the future must be men and women of integrity who internalize these principles. In relationships, operate mostly in the realm of being affliative, being democratic and being a coach. Relationships are the critical binding force to empower learning. 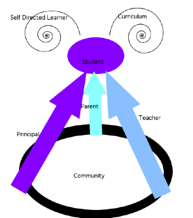 The diagram I have created here attempts to provide a graphic depicting the relationship of the student, teacher, principal, and parent in our community of learners. Students are at the centre and we are supporting them. All three are working together as part of the community to grow their learning capacity. Students are growing in the ability to be self-directed learners and using the content to practice with. I offer to any community I belong to enthusiasm, energy, and a strong work ethic. Both directly and indirectly, my skills and resources will keep learners and learning at the center. While effective management is important, instructional leadership will remain super-ordinate.